This intermediate episode is an action formula and we will learn how to talk about the weather informally and formally, using the Future verb tense. How to describe permanent and momentary weather conditions. 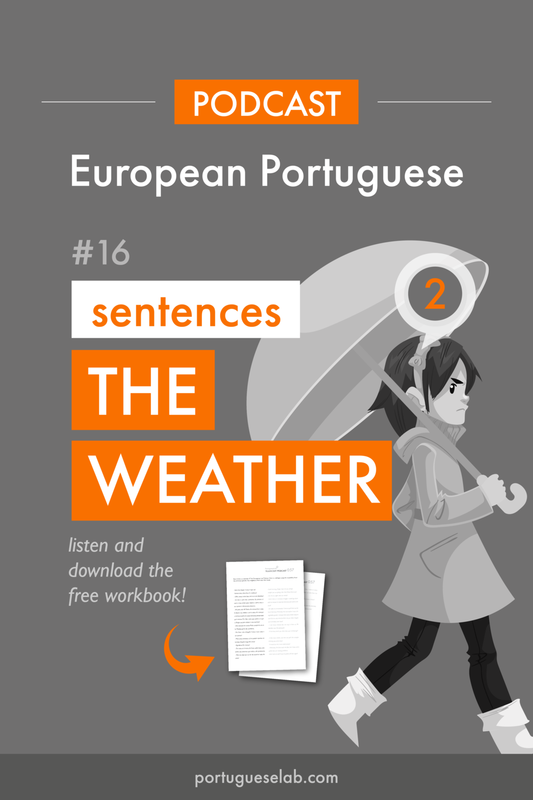 How to talk informally about the present weather conditions (Present / Estar+a+infinitive). How to talk about future weather conditions (Ir+infinitive / Future). How to ask how the weather is / will be. To understand a weather forecast. To talk about how the weather is, you can use the verb to be, ser, and you can use the verb to be, estar. Both these verbs mean to be, one is used to talk about permanent characteristics (the verb ser), and the other is used to talk about momentary characteristics (the verb estar). O Verão em Portugal é ameno. The summer in Portugal is mild. This means the weather in general, not how the weather is today. O tempo hoje está bom. The weather today is good. This is the weather at this precise moment. Tomorrow it might be different. When talking about general characteristics using other verbs, we also conjugate the verb in the present. Chove muito no Outono. (chove, from the verb chover, to rain). It rains a lot in Autumn. Está a chover muito agora. It's raining a lot now. The verb is conjugated in the third person. It's going to be hot. The conjugation (the verb ending for each personal pronoun) will be the same for all verbs. For regular verbs, the ending is added to the infinitive. For irregular verbs, often the infinitive is adjusted before the endings are added. [ir + infinitive], conjugating the verb in the future tense. Irá chover. - It will rain. Irá nevar. - It will snow. Irá trovejar. - It will thunder. Como vai estar o tempo? Como estará o tempo no Porto? Finally I invite you to listen to a weather forecast. You can check the translation in the episode related resources. Hoje teremos uma ligeira melhoria nas condições atmosféricas e uma pequena subida da temperatura. Today we will have an improvement in the weather conditions and a small rise in temperature. 26 graus de máxima para o Porto com céu pouco nublado. Oporto will have a maximum of 26 degrees with the sky a little cloudy. Lisboa hoje terá boas abertas no céu, com uma temperatura máxima de 28 graus. Lisbon today will have several moments with clear sky, with a maximum temperature of 28 degrees. (aberta = when the clouds part to reveal clear, blue sky). As cidades do interior, como Beja, terão temperaturas mais altas com 34 graus e céu limpo. Inland towns, like Beja, will have higher temperatures with 34 degrees and clear skies. Nos Açores o céu estará pouco nublado em quase todas as ilhas. In the Azores the sky will be cloudy on almost all of the islands. Ponta Delgada terá uma temperatura máxima de 24 graus e choverá ligeiramente da parte da manhã. Ponta Delgada will have a maximum temperature of 24 degrees and it will rain slightly in the morning. Haverão também poucas nuvens na Madeira onde os termómetros subirão até aos 26 graus. There will also be a few clouds in Madeira where the thermometers will reach 26 degrees.